E.L.T. Mesens, Brussels, by whom acquired in June 1930. Charley Toorop, Amsterdam, by whom acquired from the above in the early 1930s. Acquired from the above by the previous owner circa 1965 and thence by descent to the present owner. Letter from René Magritte to E.L.T Mesens, 10 June 1930, in Lettres mêlées, p. 29. D. Sylvester (ed. ), René Magritte. Catalogue raisonné, vol. I, Oil paintings, 1916-1930, Antwerp, 1992, no. 324 (illustrated p. 346). Brussels, Salle Giso, E.L.T. Mesens & E. van Tonderen présentent seize tableaux de René Magritte, February 1931, no. 10. Hanging from a too-dark sky, two frames filled with blue sky and cloud, hanging impossibly over a townscape. These paintings-within-a-painting disrupt our entire understanding of the world within the picture. Is it night? If so, why are there frames of a day sky? Yet if it is day, why is the majority of the sky completely black, without even the visual relief of stars? And in addition, another quandary raises its head: do the frames contain segments of the cloud-flecked sky or representations? Magritte has deliberately used these elements in order to strip away the entire suspension of disbelief inherent in painting. In a sense, these pictures-within-the-picture serve the same purpose as the slogan at the bottom of La trahison des images of 1929-- here, they insist upon the fact that Ceci n'est pas le ciel. By highlighting the impossibility and artifice of the scene in Le promenoir des amants, painted either at the end of 1929 or the beginning of 1930, Magritte is demanding that his viewer ask different questions about the reality with which we are surrounded. The deliberate flatness implied by these framed portions of sky hint at a further dimension behind the curtain of our perceived universe. Humanity, Magritte believed, was so over-reliant on the sense of sight as to have rendered itself blind to the wonders and miracles of everyday existence. Le promenoir des amants is an attempt to jolt the viewer into a new, fresher, more accepting look at the world around us. Not an understanding, but an appreciation of the infinite wonder of existence. For Magritte, this was evident in the strange poetry with which life, and the associations between various objects, was saturated, and it was through his disruption of the taken-for-granted order of things in the visual world around us that he managed to highlight this mysterious character. Describing the pictures from this early period of his Surrealism, Magritte explained that they were 'the result of a systematic search for an overwhelming poetic effect through the arrangement of objects borrowed from reality, which would give the real world from which those objects had been borrowed an overwhelming poetic meaning by a natural process of exchange' (R. Magritte in 1938, quoted in H. Torczyner, Magritte: Ideas and Images, translated by R. Miller, New York, 1977, p. 216). Frames, townscapes, skies all these are elements borrowed from the real world, re-ordered and then presented to the viewer in a scene that has its own magical poetry. It is perhaps a reflection of this poetry, his own awareness of the enchanted atmosphere of this painting, that it is called Le promenoir des amants, a title which may have been inspired by the title of an ode in the seventeenth-century French poet and playwright Tristan L'Hermite's Amours de Tristan (it was called Le promenoir des deux amants). Magritte's unique interpretation of the Surreal placed him occasionally at odds with the Paris Surrealists, with whom he was linked at the time that Le promenoir des amants was painted. For him, the external phenomena of the world around us and the waking, wide-eyed re-interpretation of them were the key; he had little interest in the automatic, the subconscious, and so forth. Magritte's paintings are invitations to a new and fresh understanding of the world, rather than an exploration of the subliminal associations, mental processes, traumas or complexes of the human mind. Magritte's distance from the Parisian Surrealists became all the more open during precisely the period at which Le promenoir des amants was painted. For it was in December 1929 that, at a soirée being hosted by the guru of Surrealism, André Breton, it was remarked that Magritte's wife Georgette was wearing a crucifix. This was a cherished treasure that had formerly belonged to her grandmother, but when Breton saw this symbol of organised religion, he immediately complained. Georgette walked out, and Magritte followed, beginning one of the first in a sequence of stand-offs that would recur between the Belgian Surrealist and his French counterparts. Although Magritte was judged by some of his friends to have acted too precipitately, it was clear that he had been chafing at the bit within the context of Parisian Surrealism, constantly needling Breton at similar gatherings. His walking out of Breton's flat, and the distance that he now retained from much of the group of Paris Surrealists, marked then the culmination of mounting tensions, rather than an out-of-the-blue explosion. Le promenoir des amants was painted either just before this event, or in the months that immediately followed; these were to be Magritte's final months in Paris. Coming as they did during the increasing Depression, they were racked with financial strain, and this, as well as Georgette's own homesickness, would eventually lead Magritte to return to Belgium, leaving Paris behind him. The picture-within-a-picture is an almost trompe-l'oeil element that has long featured within the painting tradition. After all, what is more natural for artists than to portray the world within the context of their own tools? With these sections of sky floating above a town, there is a god-like aspect to the role of the artist, creating day within the small context of this represented world. These pictures of the sky could have been borrowed from some vast bourgeois drawing room, with their elegant gilt frames, or indeed from the artist's own studio. Indeed, these complex games of representation and reality that the frames of sky introduce become all the more intriguing when one looks at Magritte's Les perfections célestes, another work from the same period from early 1930 which depicted a cloudscape, but split across four different framed canvases. Le promenoir des amants therefore appears to contain a section of Les perfections célestes, prompting the viewer to wonder which work came first, and whether indeed the present work perhaps inspired the other. 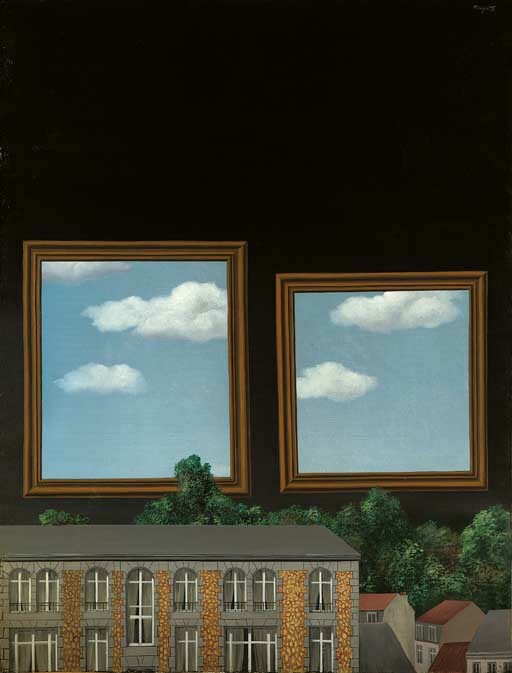 Likewise, these framed windows into another reality chime with some of Magritte's visual preoccupations of the period, for instance the wall of different backgrounds that features in Au seuil de la liberté of 1930, where a cannon faces frames of wood, buildings, sky, woman, and so forth. It is strange to think that these paintings are from an age that pre-dated the channel-zapping age of commercial television in which we live today-- they appear almost prescient in their presentation of a world of small screens, sections of interchangeable reality between which we can flick night/day, flesh/wood, sky/building and so forth. The frames in Le promenoir des amants hang like cinema screens upon which a colour reality is projected, against the dark background of a blacked-out area, recalling the endemic cinemas of the age, and implying once more that there is another reality that looms beyond the reflected vision that is here before us.